Starting a civil disobedience movement for the peaceful settlement of the conflict of the Jeju naval base project and for the realization of just law. The Jeju naval base project has numerous problems such as doubtful selection of location, resolution on invitation by conciliation and betrayal, ignorance of Gangjeong villagers’ opinion, unreliability of the Environmental Impact Assessment by and large, cancellation of absolute preservation areas without notice, suspicion on the flaws in the base layout, unreliable and illegal construction, falsehood in the so called Civilian-Military Complex for Tour Beauty. Still, the government and navy are not only enforcing naval base construction with the police force at the head but are recently enforcing 24 hours construction to secure the 2013 budget, indiscriminately confining and arresting Gangjeong villagers, peace activists and even clergymen who make efforts to stop construction. In the state power’s oppression such as the above, the responsibility of court is also big. The court forgetting its constitutional mission of being the last fortress to keep the basic rights of people, has given indulgence to the wrong executions of the power by taking unjust trial to unilaterally raise the hands of government and navy. As a result, Gangjeong became the site of a lawless world where democracy is damaged and human rights are trampled down as illegality and law-evasiveness take power to themselves. In the situation when every legal effort to stop unjustly dominating power became meaningless, there is nothing that I, a law school professor and lawyer can do to stop the forceful naval base construction. 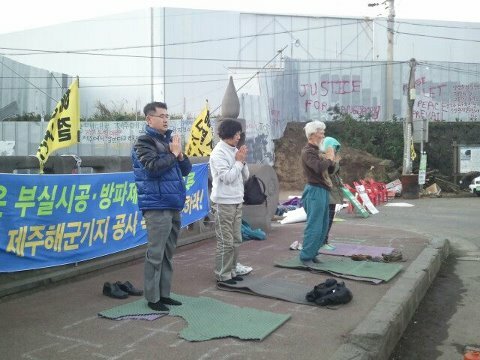 Even now, there are Gangjeong villagers and peace activists in front of the Gangjeong construction site, who struggle risking the danger of punishment, by delaying naval base construction (destruction) even for 5 minutes. They are the people who follow the law of consciousness in the situation when the laws of the positive and of the conscious clash each other. They are in fact already doing the civil disobedience movement. Their courageous resistance make me feel shame, who have been confined inside the fence of the positive law, and make me ask what the true law is. 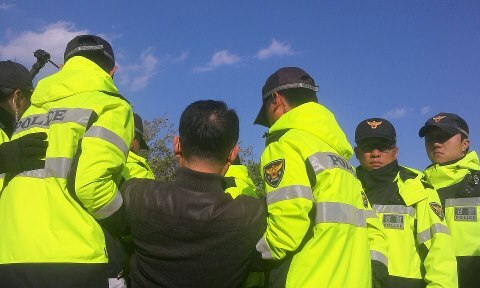 Now, aspiring for the peaceful settlement of the conflicts in the Jeju naval base project and for the realization of just law, I will start the civil disobedience movement until the government and navy stop the enforcement of naval base construction. I will stop, with my body, entry and exit of construction vehicles in front of the main gate of naval base construction site more than once a week. For the beginning, I will stand in front of the construction gate from 10 am to 6pm on Monday, Nov. 12. I respect law. But when the law is not just, the law is merely violence. Therefore it is the natural right and responsibility of democratic citizens to disobey to the illegal law. It is nothing but to stop to be human being to give up that. Therefore the civil disobedience movement that I am to do is never the movement to ignore law. It is the movement to make the true law stand. It is an effort to save the Constitution being invaded by unjust power. Before the start of the civil disobedience movement, I declare the below principles based on the spirit ofSatyagraha by Mahatma Gandhi. Firstly, I reject every violent way. I will act whatever happens with non-violent and peaceful way. Violence kills life while non-violence respects lives and make them live. Secondly, there is a saying that ‘You shall hate crime but not the criminals.” Even though I am infuriated from the unjust execution of power by the personnel of the government, navy and police, I never hate them. Hatred kills life. I also believe that the government, navy and police personnel are dignified beings like sky, with reason and consciousness as human beings. Thirdly, I will be willing to suffer from any disadvantages following civil disobedience. If the police rough out and confine me, I will be willingly taken. If they want to arrest me, I will be willing to be arrested. If they imprison me, I will be willing to be imprisoned. The government can confine my body but not my spirit. If the government attempts to detain my body more and more, my spirit will freely fly up. Through the civil disobedience movement, I hope the government, navy, court, police can change like the below. I hope the government no more betrays and disdains citizens but recognize them as the SKY, being afraid of them and serve them. I hope the court no more wait-and–sees the government but takes trial faithful to the Constitutional mission of control of powers and protection of basic rights. I hope the navy is born again as the navy for citizens to whom it serves, not as the navy for their own, who fights against the citizens. I hope the police outgrowing from the role of maid to power, to be the true cane for the people from whom they get love and respect. I also appeal to all Jeju Island people and citizens to have courage and join the civil-disobedience movement. I urgently ask them to join us until the conflicts in the Jeju naval base project is peacefully settled and just law stands. 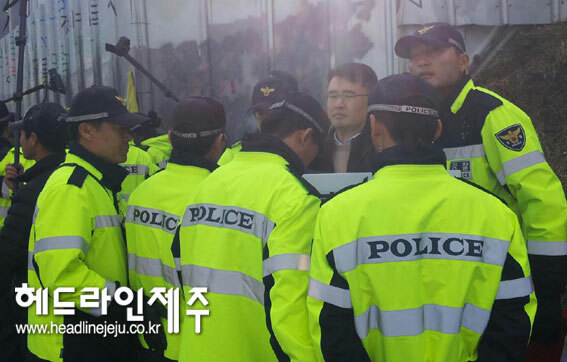 Headline Jeju, Nov. 12, 2012 Prof. Shin was detained in police circles more than 7 times on the day. Photo by Song Chang-Wook. Prof. Shin ends his first day with the 100 bows early in the next morning, 7am, Nov. 13.